After the success of the film ‘ Jurassic Park ‘ many children are very much interested in collecting information regarding the different varieties of dinosaurs that lived millions of years ago. The Libonectes were not of the dinosaur specie category but under the marine reptile family called plesiosaurs. Plesiosaurs are marine reptiles lived during the early Jurassic period or Triassic period. Even though plesiosaurs were believed to be vanished, some people claim that animals alleged to be living in certain lakes might be living plesiosaurs. They make a claim seeing the animal Nessie, which is known to be living in Scotland, Loch Ness and in the Champlain Lake in the United States of America. Plesiosaurs were classified into two major sub-groups. They are larger headed, short-necked ‘pilosaurids’ and small headed, long-necked elasmosaurs. Libonectes belong to the second category (i.e.) it had a long neck with small head. Even though, this classification has been made, some researchers do not agree upon this classification of Plesiosaurs. This is because, according to them some of the plesiosaurs falling under the first category (i.e.) pilosaurids also were to a certain extent related to the second category elasmosaurs in their appearance. Different dinosaurs coming under the category of pilosaurids were ranged from 2.4 to14m long (i.e.) 8 to 46 feet long in size. With the evolution, the pilosaurids with longer neck (i.e.) elasmosaurs tended to get even longer necks. All these had short tail and broad body. Libonectes is an extinct genus belonging to the plesiosaur order. It was known to have been lived in the late Cretaceous period. It was known to have been lived around 65 million years ago. It was an omnivorous (i.e.) it would have eaten both meat and plants. 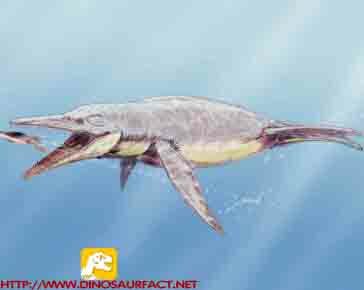 From the fossils of Libonectes, it was found that it can grow around 23-47 feet long (i.e.) 7-14m long and it was related to Elasmosaurus since it possessed the same body structure as that of the Elasmosaurus. It had large flippers and a short tail. Its skull had forward facing long teeth perfectly designed for catching squid and slippery fish. It would have kept its body strong by swallowing rocks and its four strong flippers would have helped it to swim quickly. It is believed that it controlled its buoyancy by consuming the bottom sea rocks. It was once believed that plesiosaurs would have been able to raise their neck above the surface of the water. But, from the fossils of Libonectes, it was found that the base of the neck was too stiff. So it might have able to move its head only slightly up and down and side to side. Libonectes is classified under Animalia kingdom, Chordata phylum, Sauropsida class, plesiosauria order and under the sub order plesiosauroidea and it belonged to the family of elamosauridae. In Texas, the specimen of different dinosaurs is being kept for display and they also have the skull of Libonectes. According to them, they found the specimen near Cedar hills in the Dallas county of Texas.